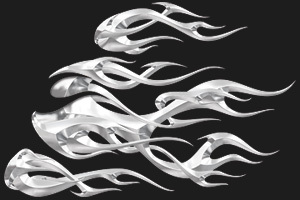 A unique flame graphic that simulates the look of metal chrome since it's neutral in coloring with sharp 3-d bevels. It features a 3-piece design allowing for different positioning and layout flexibility. The flame features a weaving or "dueling" look that really enhances the look of the flame licks. Ideally suited for the hood of a vehicle, but can be used anywhere. In addition, this design compliments our Dueling Side Flames perfectly, as they were designed to be used together. If purchasing the Hood and Side sets, be sure the sizes match so they stay in scale with each other, i.e. Medium Dueling Side Flames and Medium Dueling Hood Flames will look best together. Sold as a pair, right and left sides.